I woke early one morning in Istanbul to check out the view from one of the city’s many terraces and I couldn’t have been greeted by a better sunrise. 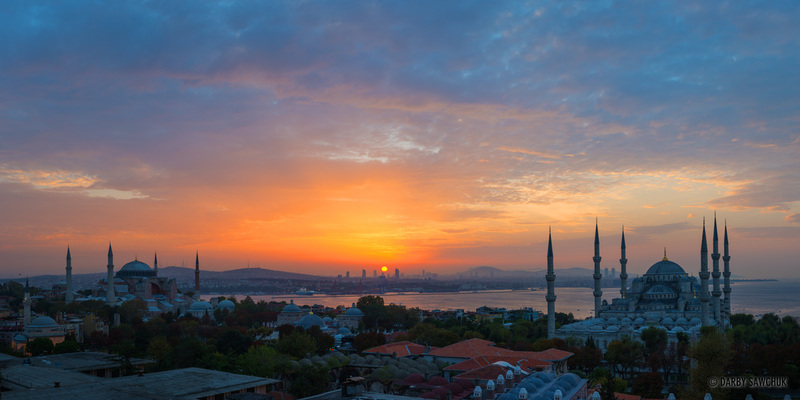 This particular panorama frames the sun with the Hagia Sophia on the left and the Blue Mosque on the right. This entry was posted on Thursday, November 14th, 2013 at 6:48 pm. It is filed under Blog, Istanbul, Photo of the Day, Photography and tagged with cityscape, istanbul, panoramic photography, Photo of the Day, Photography, potd, sunrise, travel photography, turkey. You can follow any responses to this entry through the RSS 2.0 feed.